On Monday in Australia, due to an internal party leadership challenge, a senate-only vote will be held to determine if the person who lead the country out of today, will be the same one who marches it into tomorrow. Despite public opinion polls favouring one direction in vast majorities, it seems as if the opposite will win the closed-off decision for the title of Prime Minister. Personally, regardless of who wins, I think it's an abortion that the challenge for Prime Minister is decided by the senate alone and not the public which they serve. The nation's top job, whether challenged by the opposition or those internal to the ruling party, should always be open to (if not decided by) the voice of the people. It all reminds me of two things; one, that great line from Alan Moore's V For Vendetta "People should not be afraid of their governments. Governments should be afraid of their people" and the Occupy movement's main tagline "We Are The 99%". Swap Australia for the UK, and the local Occupy movement is taking a note from formative times of days gone by and creating Occupy Records. Through this organisation, artists are able to donate tracks to the movement, which are then compiled onto exclusive compilations for you to order as part of their fund-raising effort. However, music isn't the only chart-topper on their 'Up for grabs' list. Alan Moore has stepped up, signing over 40 copies of V For Vendetta and equal numbers of 'V' resin masks, available now for you to own. If you would like to experience the music of a movement, their first album Folk The Banks featuring the likes of Ani Di Franco and Tom Morello, with a March digital release, is available after the jump. 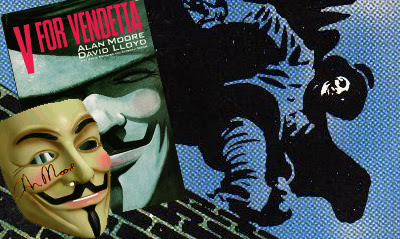 If the idea of reading a signed V For Vendetta graphic novel while wearing a signed V For Vendetta Guy Fawkes mask is what floats your boat, then the chance to make that a reality is also right after the jump. Go to it!